Mrs Dragon's Den: Think of the Children! A sporadic spotlight on the things that make Huntsville, Alabama standout. The hubby and I went for a walk down the green belt over the weekend, where we spotted a new sign that had been installed. Now I appreciate dog owners who pick up after their pooches. I prefer clean paths, especially in the hot, humid summer that will shortly be upon us. But who wrote this sign? Really? Attack of the dog waste? And that's not the only puzzler. 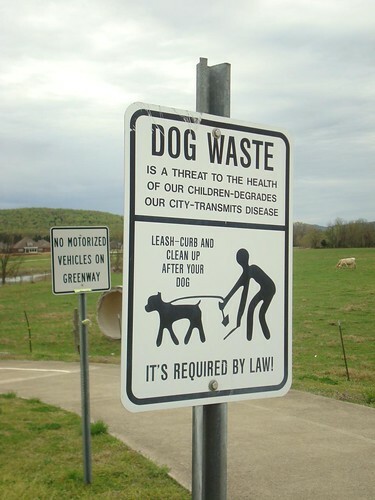 Who uses language like "degrades our city" on a road side sign? What on earth is "leash-curb"ing? What did the poor sap who had to create the artwork think? Sorry for the typos. Still getting used to this new phone keyboard!! Aly--exactly! It's not the message, it's the delivery. It's just a bit...off. Shelly--well yea, but there is nasty and dangerous stuff everywhere if you aren't parenting your children.